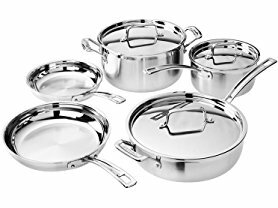 Today only and while supplies last this Cuisinart MultiClad Pro Stainless-Steel Cookware 8-Piece Cookware Set is just $109.99 (Retail $510) at Woot.com! Shipping is FREE for Amazon Prime Members or only $5 flat rate. Elegant and contemporary, the Multiclad Pro line from Cuisinart consists of deluxe cookware for the professional home chef. The exteriors of the 18/10 stainless steel pots and pans feature a handsome brushed finish, while the interiors are mirror-polished for non-reactive, quick release of foods. The tri-ply Heat Surround technology sandwiches an aluminum core in the base and side walls for superior, even heating. You'll also find solid cast stainless-steel handles that stay cool on the stovetop, tight-fitting stainless-steel lids, and drip-free pouring rims. Each piece is oven-safe to 500°F, and the pans are safe for broiler-use too.